When Is It Time for a Quality Management System for Your Early Stage Firm? Starting up a medical device company takes a lot of time, money and effort. In addition to the research, fundraising, product development, clinical trials, etc., the FDA and other regulatory agencies require a quality system to be defined and maintained. But when is the best time to implement a quality system in your medical device startup? 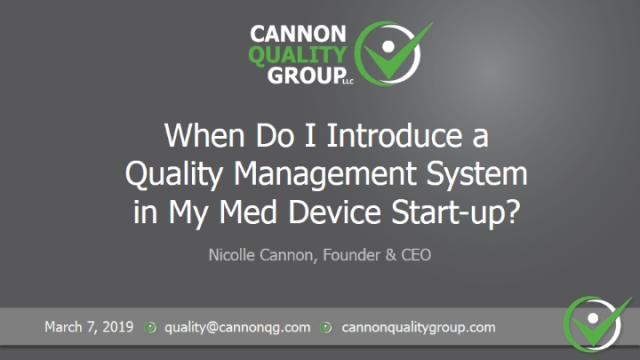 Recorded live in March 2019, Nicolle Cannon, CEO of the Cannon Quality Group hosted. Nicolle provided guidance and best practices to quality systems implementation and answer your questions. As the world’s #1 customer success platform, Salesforce has helped thousands of manufacturers transform sales, service and marketing. But there’s more ways the Salesforce cloud platform can help manufacturing companies with their digital transformation. For the highly customer-focused Engineer to Order business, the Salesforce platform can uniquely help sales, engineering and operations work better together on changing customer requirements, product designs, tooling estimates and supplier updates to deliver more winning and profitable bids. Join this webinar with Salesforce and Propel, a Salesforce manufacturing software provider, to learn how companies are already improving their Engineer to Order processes and increasing product throughput by 500%. Tony Kratovil, VP Manufacturing Solutions at Salesforce, and Miguel Tam, VP Alliances at Propel, will share how Salesforce and Propel are helping different teams collaborate directly with customers on everything from due dates, bills of materials, manufacturer parts and more. Changing customer expectations, new types of competitors, and more complex products are endangering the entire business model of engineer-to-order (ETO) companies. ETO companies need to change now because the old game of throwing information back-and-forth between engineering, sales and operations is no longer good enough. Customers are no longer satisfied with mediocre response times, lack of project visibility and disjointed communication across sales, engineering, and operations. Blaming other teams for lower margins from poorly coordinated quotes doesn’t help with lost business to more nimble competitors. In this webinar, Andrew Reiser of Mountain Point, a Salesforce and manufacturing consulting firm, and Miguel Tam of Propel, a Salesforce manufacturing software provider, will share how best-in-class companies are embracing the cloud to work better together, with internal teams and customers, and win more business. This live webcast will cover how cloud applications like Propel and the Salesforce Sales Cloud can create an integrated business process from initial customer request to design discussions to winning customer quotes. Being customer-centric in the medical device industry isn’t just about personalized healthcare or integrating IoT feedback into your next generation of devices. Customer centricity has a major role in reducing risk with your post-market surveillance and product complaints process. By having a much more streamlined process to gather customer feedback - both positive and negative - medical device companies can lower risk, improve regulatory compliance, reduce errors and increase customer responsiveness. In this webinar, Miguel Tam of Propel will focus on the importance of putting your customers first and integrating customer feedback directly into your product quality processes and design reviews. View the Future of QMS today! Join us for a live and interactive demonstration of Propel’s game-changing cloud QMS solution. See how quality and complaint management can ease the burden of regulatory compliance for medical device and other regulated industries. Companies have been integrating CAD and PLM for decades, so is there anything really different that cloud technologies can do? For over 20 years, integrating CAD systems like SolidWorks and Creo to PLM systems has helped mechanical engineers be more efficient. But what about everyone else who needs to see the latest product updates? That’s where the cloud comes in. With their brand new cloud CAD connector, Onshape and Propel are changing how companies can design, launch and sell. The newly launched Onshape and Propel connector not only helps mechanical engineers be more productive, it also allows everyone inside and outside a company to securely share product designs and data. In this webinar, Joe Dunne, Head of Developer Relations at Onshape, Jayson Kadlecek, Product Manager at Propel, and Miguel Tam, VP of Marketing at Propel, will explain the benefits of an integrated cloud CAD and PLM solution. Joe and Miguel will walk through specific use cases that customers are exploring, and Jayson will do a live demonstration of how Onshape and Propel work for everyone to deliver amazing products. Note: Contact information from this webinar will be shared with Onshape. Modern cloud QMS solutions for medical devices provides closed-loop quality management with integrated product lifecycle management (PLM), CRM to speed products to market while maintaining regulatory compliance, all in the cloud. If your company is thinking about buying software to help with product development and manufacturing, validation is a critical step for complying with FDA 21 CFR Part 11 and Part 820. But many firms often lack detailed expertise and experience to make sure their non-product software is validated. With lack of resources and direction, how can you make sure your software is validated at a reasonable cost. Brad Hinke, Director of Quality Services & Validation at Propel will host a live webinar and provide guidance and best practices from real-life lessons on validation. Brad has worked with both small and large medical device firms in all aspects of validation and implementation. - steps you must do to be compliant with the FDA. Is your company developing or planning to develop a software product that meets the definition of a medical device? In January 2019, FDA published its draft working model for a new precertification program, to supplement its medical device approval process for software which functions as a medical device. The FDA recognized that the traditional regulatory methodology is not well suited for the fast-paced, iterative-design development used for digital health software products. - Is my company eligible for the program? - What is the timeline for the new regulations? - What does it mean to be pre-certified? - What are the risks of non-participation? Propel and Salesforce together offer medical device companies an integrated, streamlined and effective way for capturing, investigating and resolving customer complaints. Watch the 5-minute video to better understand how integrating PLM, QMS and CRM on the same Salesforce platform can help you reduce delays, errors and risks with your customer complaint process. Featuring cloud PLM leader, Propel, and the cloud CAD provider, Onshape. Recorded live. One of the most common questions Propel gets is about our security. Here's a short video explaining our technical security, data security and organizational security with our cloud PLM software. Both PLM and ERP vendors tout capabilities for managing bills of materials (BOMs), changes, versions, files and other information related to your products. This makes some people wonder why you need both. The truth is PLM focuses on planning, while ERP focuses on execution. What makes Propel different? Because we're built on the Salesforce platform, it's easy to tie customer, sales, engineering and operations together to improve the Engineer to Order process - and deliver products that customers will love. You know about new cloud PLM solutions in the market. You probably heard that older PLM companies have cloud offerings. But which PLM solution is best for your company? We will discuss the PLM and CAD landscape and provide advice on how to determine your best options. Propel helps manufacturing companies bring products to market ridiculously fast. Propel offers cloud PLM, PIM and QMS software that helps all your employees, partners and customers deliver the best ideas to market. Propel solutions support digital transformation and Industry 4.0 initiatives by enabling seamless collaboration within companies and with external design, manufacturing and selling partners. Follow the Propel channel for the latest information and best practices for product development, quality management, product information management, product lifecycle management, and omnichannel selling. Title: When Is It Time for a Quality Management System for Your Early Stage Firm?